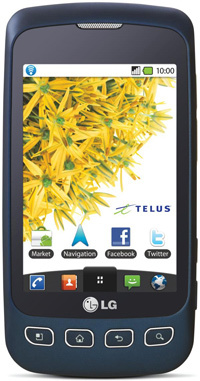 TELUS has officially launched the LG Optimus 3G. If this phone seems familiar it is because it is identical to the LG Optimus One launched by TELUS and Koodo not too long ago, except for one glaring difference; it is a CDMA device. Now one would wonder why would TELUS not only launch a device on their old CDMA network but a phone that mirrors a phone currently in their HSPA lineup of phone. Most speculation suggest this phone was to be launched in places where TELUS hasn't yet built out their HSPA network but has CDMA coverage but was shifted to a national launch instead. This presents an interesting option for people still hanging on to their old CDMA devices because of their unlimited data plans. There are some reports from people that TELUS reps have claimed that it would in fact be possible to grandfather their unlimited data plans to this device. What makes this detail really important and what makes this phone very interesting is that this is an Android 2.2 device it is Wi-Fi hotspot capable.